MMMM is a SAL created by Pull The Other Thread and taken over hosting for November by Justine's Cross Stitch. Victorian Tree is done, done, done. 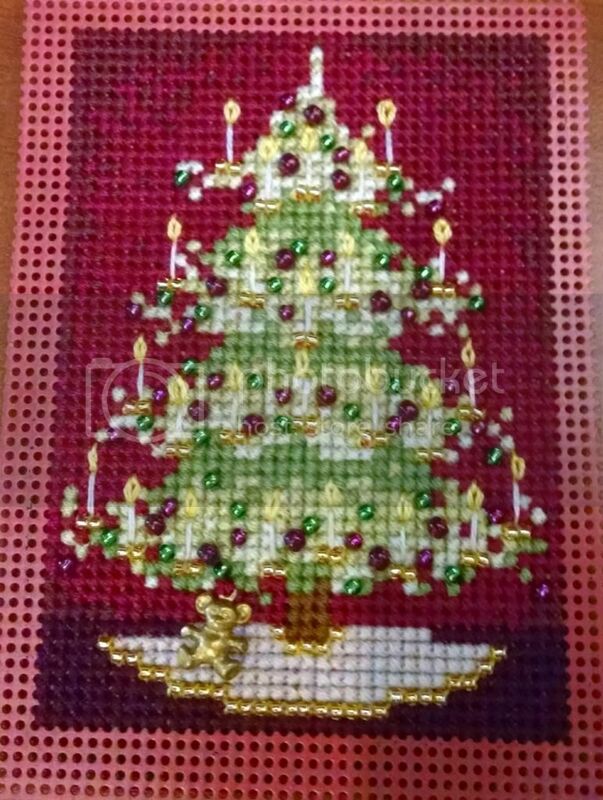 Okay, well, I need to do the actual finishing up into an ornament still (backing it and adding a string) but other than that, the stitching is all done. The coloring is a little weird in the photo (the light was wonky yesterday) but you get the general idea. My first time beading any project, and I think it went okay. I don't think I'll be winning any technique prizes any time soon, but there you go. So now I'm off to work on Teton Santa, which will be the next beading project. Hopefully that one will bead up a lot quicker, since there won't be so many random placement of assorted beads (they're more colorblocked). This is one of the most beautiful "smalls" I have seen! I love the beads. Anyone interested in forming a SAL?